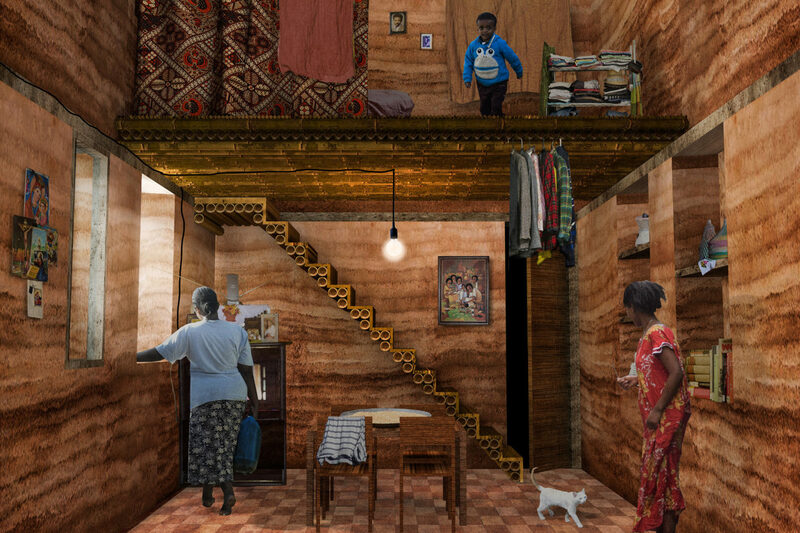 Arianna Fornasiero and Paolo Turconi designed a growing horizontal structure of affordable housing in Menem, Addis Ababa (Ethiopia) as an answer to the growing population and housing shortage in the city. 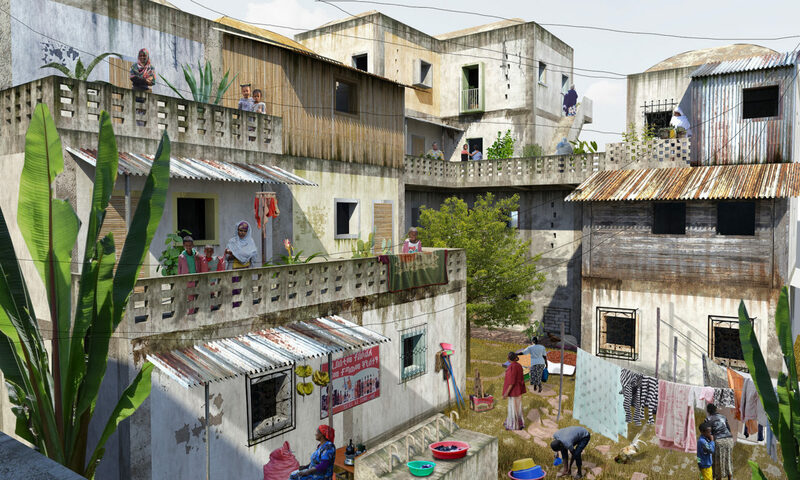 Before starting our graduation project we already had the chance to design a project of affordable housing in a Third World Country. Our journey started in Ahmedabad, India, in 2016. The project focused on the redevelopment of a informal settlement area. This challenged us to relate to a different culture with low budget restrictions. Thus, we decided to further investigate the topic of affordable housing in Ethiopia, specifically in Addis Ababa. The experience we had in India surely helped us to better understand the topic and come up with a unique strong solution. Our sources of inspiration were deeply influential in our design approach. For instance, Michel Ecochard’s work in Casablanca, Charles Correa’s Belapur Housing and Alejandro Aravena’s Quinta Monroy helped us in tackling different aspects of our project. Although, these architects operated in completely different environments and faced different topics, there is a common denominator in their work. They aim at developing solutions that are deeply rooted in the environment and take into account the traditions and the needs of the population. Thus, their architecture blends within the context and shapes according to the present and future needs of its inhabitants. One key moment influenced our entire research and design. It was right after one of our first site visits. At first, we could not grasp the social life of people because the dwellings were all fenced. We had then the chance to visit the inhabitant’s homes and we discovered an incredibly interesting hidden world. Behind the fence, the dwellings were organised in compounds; a series of courtyards, communal spaces and thresholds brought us through all the possible labels of privacy. Thus, we understood that the site was characterised by a sequence of spaces that brought you from the public realm of the street to the most intimate space of the dwelling. Our research and design process started from the reinterpretation of the aforementioned sequence of space. Incremental apartment, second floor addition. Ethiopia is in the throes of a relentless development and the population of Addis Ababa in particular is growing faster than the city can absorb. The result is a huge shortage of housing. During the last ten years, the Ethiopian government has tried to tackle the housing shortage by building blocks of apartments. However, this government initiative is unable to truly resolve the problem of accommodation. While it does achieve a high density and a fast construction process, it is a system imported from abroad and as such utterly fails to meet local requirements. Three main problems can be highlighted: production costs are too high for the target groups, the set-up fails to match the social and cultural context of Ethiopia’s urban poor and the apartment units are not flexible enough to meet changing resident needs. Our project, Rhizome, presents an alternative model for the provision of apartments. The design is rooted in the site, is technically feasible, economically competitive and flexible in both construction time and materials. Our project, therefore, can compete with the government initiative in terms of costs, construction time, labour and requisite skills. Rhizome steps off from a study into social and spatial patterns of lower income areas of Addis Ababa, particularly the Menen neighbourhood. 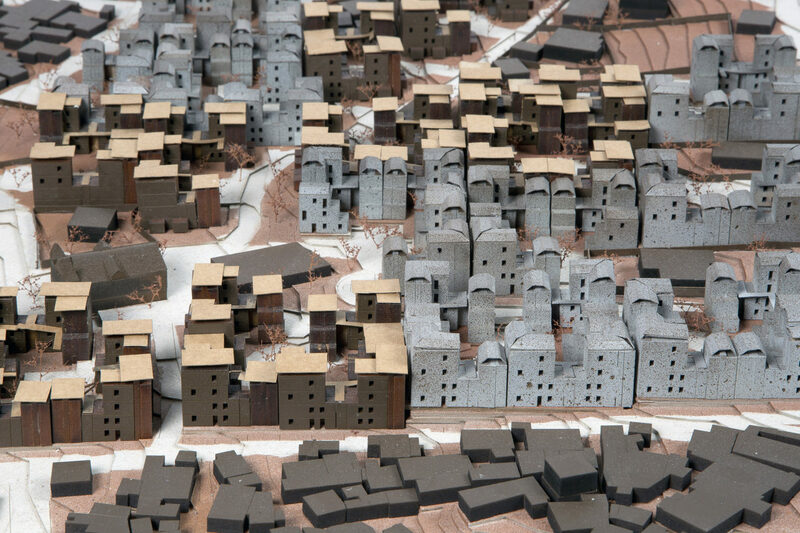 The research question was how to incorporate the different socio-spatial layers characterizing the fabric of Menen in a low-rise project able to achieve a density comparable to that of apartment buildings. Hoe can the project be feasible and promote itself as a flexible standardized system? The backbone of our project is the idea of a residential compound, a physical and social structure comprised of three elements: two incremental housing blocks and a circulation system. 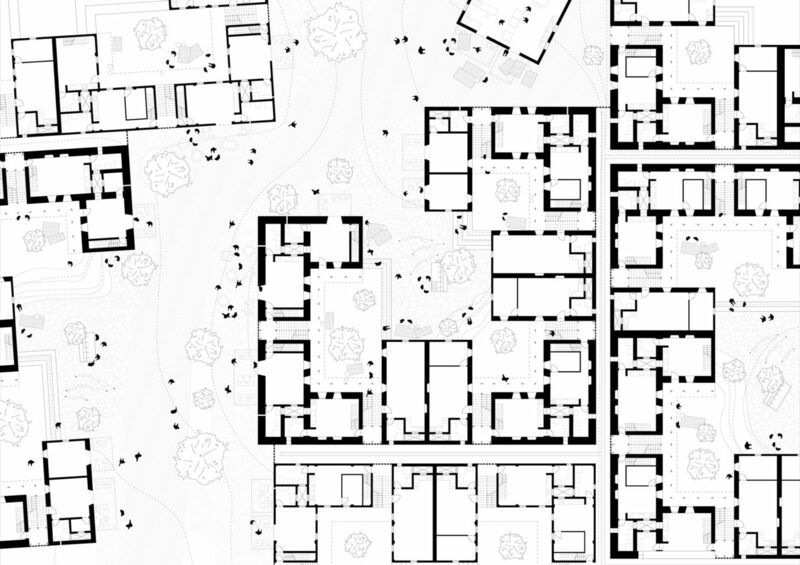 The compounds are clustered together and can be rotated, mirrored and linked to generate a spatial series, a hierarchic sequence of community spaces. This entails a holistic strategy that bridges multiple scales, from the main urban streets to the intimacy of the compound and ultimately to the most private space of the dwelling. In our project, each cluster is independent, allowing the entire project to be built in stages and in time become organically integrated in the surrounding physical structures. This strategy forestalls disruptive social and spatial breaches between old and new structures and between communities. Furthermore, the project can be built using two different methods of construction that offer more affordable solutions than those currently used in the governmental housing programme. The project can be standardized and rapidly built using a concrete structure. 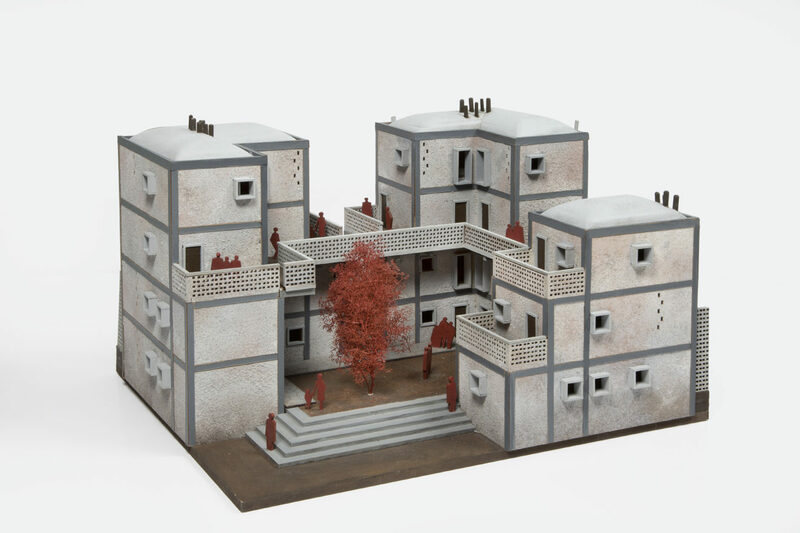 However, it can also be built with rammed earth. The former requires imported materials, a technological infrastructure and specialized skills while the rammed earth alternative is more affordable and sustainable, using locally available materials and techniques and able to involve the local population in the building process. In botany, a rhizome is associated with the growth of a plant’s underground roots. 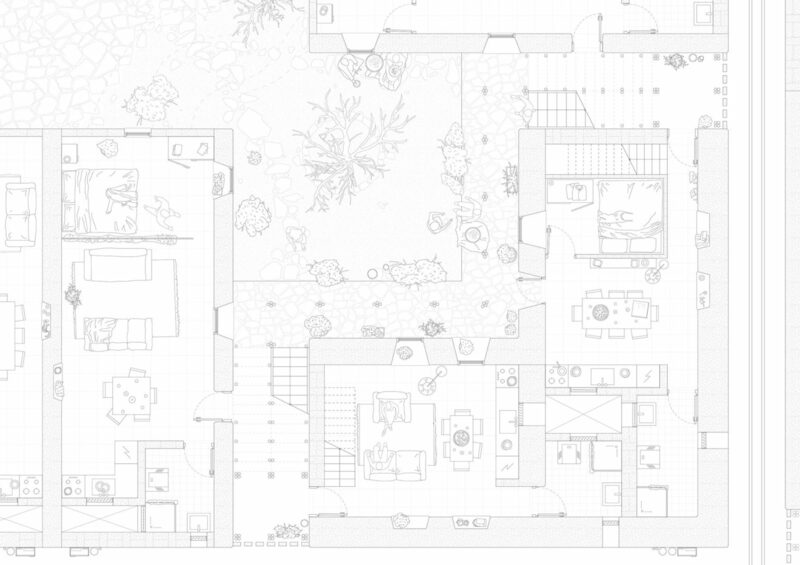 Similarly, our project stands for the continuous growth of an interconnected sequence of spaces stemming from a unique and simple element: the residential compound. We are both working at Mecanoo Architecten in Delft. It is being a challenging experience and a great starting point for our career. What do you hope/want to achieve as a designer in the near and/or distant future? Our pursue is one day to build a prototype of our design in Ethiopia. It is a pity that projects that address to Urban Global South issues do not find a sequel out of the academic field. We aimed at designing a project which is technically feasible, economically competitive and flexible in construction time and materials. Thus we strongly believe that our project works and building it would be a nice way to see if we were right or wrong. 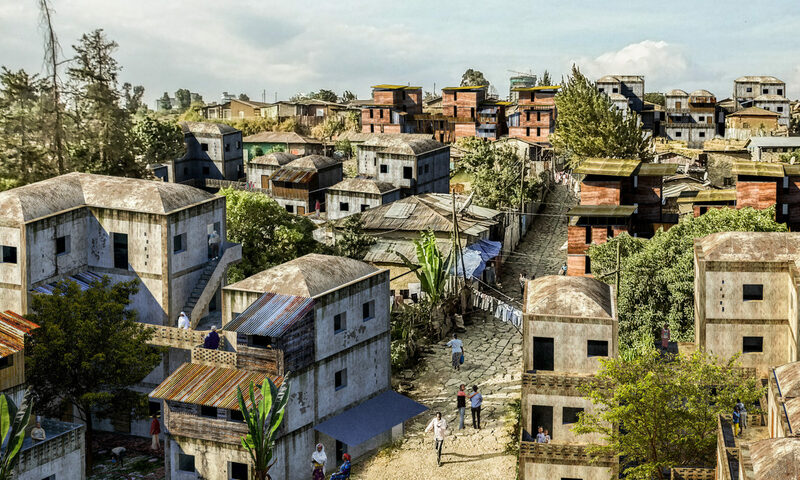 This project presents a convincing proposl for affordable dwellings in Addis Ababa. The impressive analysis preceding the design is based on local research into a great many aspects relevant to the brief. […] it is clear as clear as day that compared to current practice -apartments built by a German firm hired at the behest of the Ethiopian- this graduation project is far superior on al fronts in terms of quality.